Waste Connections of Texas is committed to working closely with architects, developers, and engineers to see that proper specifications and clearances are considered during the design and construction of commercial spaces and high rise buildings throughout the region. High rise buildings designed to accommodate a large number of occupants have the ability to generate a great volume of waste. If proper planning does not take place in order to accommodate the size and maneuverability of collection vehicles, waste removal can become an expensive, time consuming task. 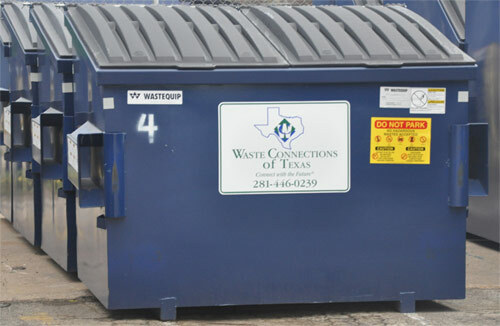 Waste Connections of Texas is available for consultation to ensure that your building meets the requirements necessary for a safe, efficient waste collection program. Before you begin the design and construction of your next property, please contact one of our commercial waste collection experts at 855-244-9248 or follow the links below to learn more about our commercial containers and specifications. Bottom Width 72" 72" 72" 72" 72" 72"
Top Width 74 1/2" 74 1/2" 74 1/2" 74 1/2" 74 1/2" 74 1/2"
Depth 35" 50 1/2" 65 1/2" 66" 78" 66"
Front Height 32 3/4" 44 3/4" 50 3/4" 59 1/2" 51 5/8" 80 1/4"
Back Height 42 1/2" 59" 57 1/2" 59 1/2" 71 5/8" 80 1/4"
PAD - Minimum inside dimensions are 12’ wide and 12’ deep. Concrete must be 3000 p.s.i., steel-reinforced and 6” thick. Top of pad must be at ground level with a concrete apron at least 4’ long. GATE OPENING - Recommended minimum is 12’ hinge to hinge. Gates must open 180˚ (Hinges should be on outside of wall). To prevent the wind from causing damage during service, a gate stop should be located 135˚ from closed position. OUR TRUCKS NEED ROOM TO WORK! Front-loader trucks are approximately 32’ long when carrying the container.